Leber congenital amaurosis (LCA) is an inherited retinal disease that causes severe visual impairment in infancy or early childhood. Current research on a gene transfer therapy may offer hope to people with a form of this disease. 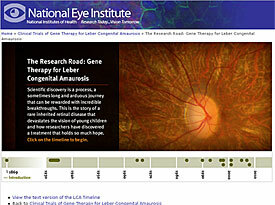 Promising Results in Phase 1 Gene Therapy Trial for Blinding Disease, September 2008.